For golf lovers seeking the splendor of northern Michigan, *Vacation Club II* is the answer! With 5 amazing top-notch courses available nearby (including The Chief, Arnold Palmer's The Legend, and a Weiskopf-designed course), summertime in Bellaire is a golf lover's dream. The resort itself features excellent tennis courts, a private beach club, an outdoor pool, a wellness spa and a health club with a full Nautilus program. 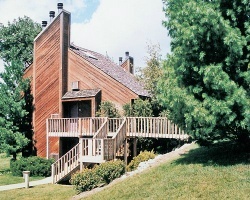 For more information, visit www.shantycreekvacationclub.com.